It can cost a great deal of money to die—at least if you're reasonably wealthy. Estates valued at more than the federal exemption of $11.2 million can expect to pay up to 40 percent in estate taxes at the federal level as of December 2018, although Congress continues debating whether to eliminate this tax. Twelve states and the District of Columbia also impose estate taxes of their own as of 2018. Here's a summary of these state taxes and the changes that have taken effect in recent years. 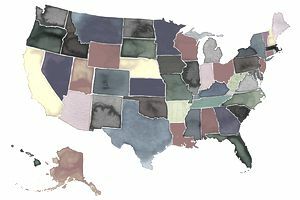 Two states saw their estate tax exemption increase on January 1, 2010: Rhode Island's exemption increased to $850,000 and Connecticut's exemption increased to $3.5 million. The Rhode Island estate tax exemption was adjusted for deaths occurring on or after January 1, 2011, based on the percentage increase in the Consumer Price Index rounded to the nearest $5. In 2015, the exemption increased to $1.5 million where it remains in 2018. The top tax rate is 16 percent. On May 4, 2011, the Connecticut estate tax exemption was retroactively decreased from $3.5 million back down to $2 million for deaths occurring on or after January 1, 2011. It's up to $2.6 million as of 2018. The top tax rate is 12 percent. Illinois saw its estate tax disappear on January 1, 2010, due to the repeal of the federal estate tax. Then the federal tax was retroactively reinstated, but Illinois' tax did not automatically return. The Illinois legislature had to act quickly at the beginning of 2011 to reinstate the tax for the 2011 tax year with a $2 million exemption. Then the legislature acted in December 2011 to increase the exemption to $3.5 million in 2012 and to $4 million in 2013 and future years. The exemption remains at $4 million in 2018 and the top tax rate is 16 percent. Hawaii brought back its state estate tax effective May 1, 2010. Although the Hawaii estate tax exemption was set at $3.5 million for deaths occurring before January 26, 2012, the tax didn't actually kick in until an estate exceeded $3.6 million in value. Then, in May 2012, Hawaii tweaked its estate tax laws to provide that the exemption will be tied to the federal estate tax exemption for decedents dying after January 25, 2012. In addition, Hawaii appears to be the first and only state that allows "portability of the estate tax exemption" between spouses at the state level. This effectively allows the first spouse who dies to transfer any unused portion of his exemption to his spouse, increasing hers. The state still matches the $11.2 million federal exemption as of 2018, and the top tax rate is 15.7 percent. Vermont's estate tax exemption increased to $2.75 million effective January 1, 2011. It remains there as of 2018 and the state has a top tax rate of 16 percent. The name of Oregon's death tax changed from an "inheritance tax" to an "estate tax" on January 1, 2012. The Oregon estate tax exemption, formerly the inheritance tax exemption, remained at $1 million for 2012 and future years, and it's still at $1 million in 2018. Currently, the tax only applies to the value of an estate in excess of $1 million. Under the prior law, it applied to the entire estate when it exceeded the $1 million threshold. The estate tax rates also changed in 2012. The majority of estates valued between $1 and $2 million paid slightly less in taxes and those valued over $2 million paid slightly more. Oregon Ballot Measure 84, which would have repealed Oregon's estate tax by 2016, was defeated on November 6, 2012, and it doesn't appear that Oregon's estate tax will be repealed anytime soon. Maine's estate tax exemption increased to $2 million effective January 1, 2013, and the tax rate was reduced. As of 2018, the exemption has increased again at $5.6 million, and the top rate is currently 12 percent. Washington tweaked its state estate tax laws in several ways in June 2013 to affect the estates of decedents who died on or after January 1, 2014. First, the state's $2 million exemption was indexed for inflation on an annual basis. Then the estate tax rates for the top four brackets increased by one percentage point. Finally, certain family-owned businesses received an estate tax exemption of up to $2.5 million. As of 2018, the exemption sits at $2.193 million and the top tax rate is 20 percent. In an unusual move, Minnesota enacted a state gift tax that went into effect on July 1, 2013. The state additionally tweaked its estate tax laws at that time as they applied to nonresidents who owned real estate in Minnesota. The new legislation included any Minnesota property that was held in a pass-through entity such as an S corporation, a partnership or a multi-member LLC taxed as a partnership, a single-member LLC or similar entity, or a trust in a nonresident's estate. Then, in another unusual move, Governor Mark Dayton signed legislation on March 21, 2014, which repealed the state gift tax retroactively. The state estate tax exemption was retroactively increased to $1.2 million for all 2014 deaths and the estate tax rate was tweaked so that the first dollars are taxed at a 9 percent rate which then maxed out at 16 percent. The estate tax exemption sits at $2.4 million in 2018. The new law also allows married couples to use ABC trust planning to defer the payment of all estate taxes until after the death of the second spouse. Finally, the law taxing a nonresident decedent's interest in a pass-through entity was also modified to exclude certain publicly traded entities, but it still applies to entities taxed as partnerships or S corporations that own a closely held business, farm, or cabin. On April 1, 2014, New York made significant changes to its estate tax laws by increasing the state's exemption to $2,062,500. The exemption was then scheduled to continue to increase on an annual basis until it matches the federal estate tax exemption in 2019. It's at 5.25 million as of 2018, with a top tax rate of 16 percent. Washington, D.C., continues to tax estates at a top rate of 16 percent. The exemption is $11.2 million as of 2018. Maryland's estate tax exemption remains steady at $4 million. The top tax rate is 16 percent. Massachusetts also has an estate tax at a top rate of 16 percent on estates valued at more than $1 million. NOTE: State laws change frequently and the following information may not reflect recent changes in the laws. For current tax or legal advice, please consult with an accountant or an attorney. The information contained in this article is not tax or legal advice and is not a substitute for tax or legal advice. Which States Have Estate Tax or an Inheritance Tax in 2013?